This year’s Keep DeLand Beautiful event goes beyond DeLand city borders and welcomes all families, businesses and communities of West Volusia to Earl Brown Park, DeLand on Saturday, March 16th to really make a difference. “Teams” of families, businesses, churches, groups, agencies will gather to celebrate and “compete” in an eco-friendly community-wide clean-up of selected areas within the West Volusia region for awards, bragging rights and, of course, making a key environmental difference within our region. Businesses which emphasize either an organic, natural, environmentally aware, earth-friendly or holistic product/service are especially welcome to participate, sponsor and support this ½ day event. Regardless of sponsorship level, your business will be positioned as a steward of the environment, community-minded and eco-friendly. Please note: Some sponsorship categories are limited in availability due to booth space or level maximums. Some are first-come, first-serve. It would be wise to secure your space and support level today via e-mail. The DeLand Area Chamber of Commerce and Orange City Alliance hope you’ll give serious consideration of making a big difference in our community and support the 2019 Keep DeLand Beautiful event as a part of your marketing and advertising programs in first quarter. 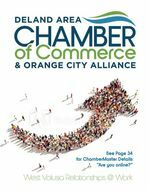 For questions or to secure sponsorships, e-mail Opportunities@DeLandChamber.Org with business name and desired level. Picnic in the Park provided by DeLand Breakfast Rotary!